Thirty years ago, any time a person needed information, they turned to someone who knew that information. Today, they simply Google their question and get a number of viable responses. The same facts are true when it comes to investing. There is so much an investor can do on his own these days. Reliance on a financial advisor for the basic functions of investing is no longer necessary. There are investors who have chosen to depend on their financial advisor to perform all of the functions related to investing their funds and managing their assets. But those numbers are dropping, according to Spectrem studies on wealthy investors. According to the new quarterly study Financial Behaviors and the Investor’s Mindset, among the wealthiest investors, 84 percent of investors use financial advisors. Among those, 17 percent consider themselves to be advisor-dependent, meaning they rely on their advisor to make most or all investment decisions. Another 27 percent consider themselves to be advisor-assisted, meaning they regularly consult with an advisor regarding most investment needs, even though the investor makes most of the final decisions. That’s 44 percent of wealthy investors with some level of dependence upon their advisor. What’s revealing about those percentages as far as advisors are concerned is that 44 percent of Ultra High Net Worth investors (those with a net worth between $5 million and $25 million) are far fewer than the result from 2010, which was a time when many investors were still climbing back from the recession. That year, 21 percent of UHNW investors were advisor-dependent and 34 percent were advisor-assisted, meaning 55 percent were leaning heavily on the services of their advisors. How much of that difference is a result of do-it-yourself investing? That is hard to say, although the same Spectrem study shows that there has been a 10 percent increase in seven years among investors who say they are Self-Directed investors, meaning they make all of their own decisions about investing with very little, and perhaps no, contact with advisors. The factors that weigh upon these findings include the ability of investors to complete the task of investing in products and services on0-line without professional assistance. But these research insights beg one question: are the investors making their correct choices when they invest on their own? In some cases, it is easy to determine if investors are serving themselves well by doing it themselves. 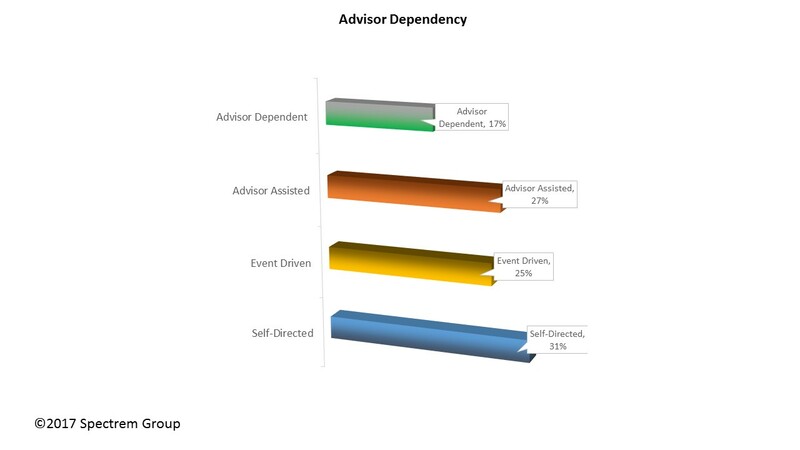 Even among advisor-dependent investors, only a portion of their investments are handled by the advisor. For advisor-dependent UHNW investors, 58 percent of their assets are handled completely by the advisor with no input from the investor. Even among those dependent investors, they handle 16 percent of their assets themselves. It would be simple to compare results of decisions made between the investor and the advisor to see which is more successful. Besides the advent of electronic investing, which has obviously taken some of the steam out of the financial advisor business, wealth is another factor that plays into the use of advisors. The wealthier the investor, the more likely they are to have a greater dependence upon their advisor. While 44 percent of UHNW investors are advisor-dependent or advisor-assisted, only 34 percent of Millionaires (with a net worth between $1 million and $5 million) place themselves in one of those two categories, and only 24 percent of Mass Affluent investors (with a net worth under $1 million) do so. Spectrem’s Market Insights report for 2017 shows a continued rise in wealth among Americans, and the growth of UHNW investors over one year was a whopping 7 percent. That means there will be more investors who are more likely to need the wisdom of a financial advisor. The Spectrem study is the most revealing report in terms of investor behavior. It includes an examination of the factors that determine investment choices investors make, the national and personal concerns that affect those choices, and the retirement considerations that are involved. The more an advisor can relate to the investor on an individual basis, the more reliant that investor may be upon the advisor. It’s all in the details. Even among advisor-dependent investors, very few place 100 percent of their assets into the hands of a professional. In meetings with investors, advisors should determine if there are assets the advisor would do a better job of handling, while determining which assets are best left in the hands of the investor. Clients are likely to appreciate when an advisor admits they do not need to handle every dime the investor has to invest. It adds a level of trust and honesty to the relationship, and those are historically shown to be two of the most important factors in an investor-advisor relationship.